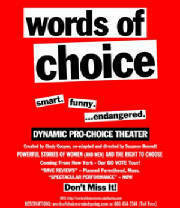 Dynamic pro-choice theater created by Cindy Cooper, featuring excerpts from The Choices We Made. "A river of blood runs through The Choices We Made, and it runs throughout the history of womankind. That river stops, more or less, with the installation of that shag carpet. The carpet, and the women who found the money to pay for it, along with all the women and men who made possible a context in which an abortion could be performed legally, safely and even humanely--together they say: Enough." --Caitlin Flanagan, "The Bloodiness of Being Female"
"Journalist Angela Bonavoglia steps back and lets the contributors speak for themselves in honest, conversational tones." "Powerful oral history--a collection of wrenching testimonials...Anybody who has strong feelings about the issue, no matter which side he or she supports, would find it worthwhile reading. To what has become a highly publicized and sometimes nasty debate, The Choices We Made gives a human face." "This book brings a human dimension to the debate about a woman's right to choose...Highly recommended." "Old and young, rich and poor, black and white, celebrities and unknowns--the voices vary...but their stories...have a powerful cumulative impact. Not for the fainthearted.